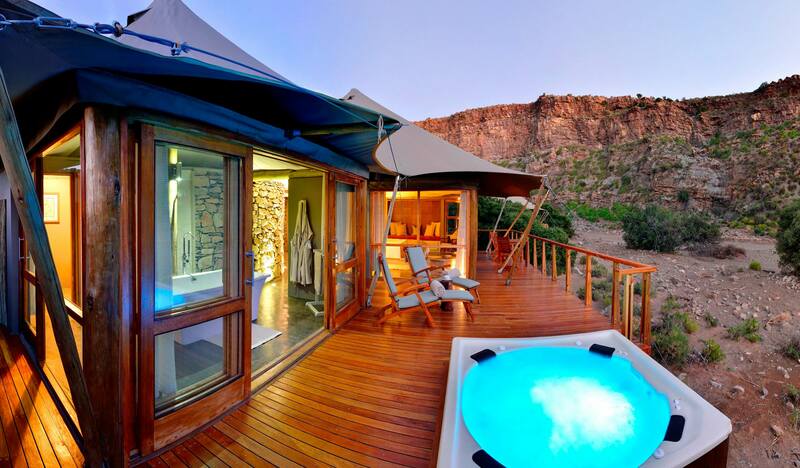 At 54,000 hectares Sanbona Wildlife Reserve is one of South Africa’s largest private reserves. 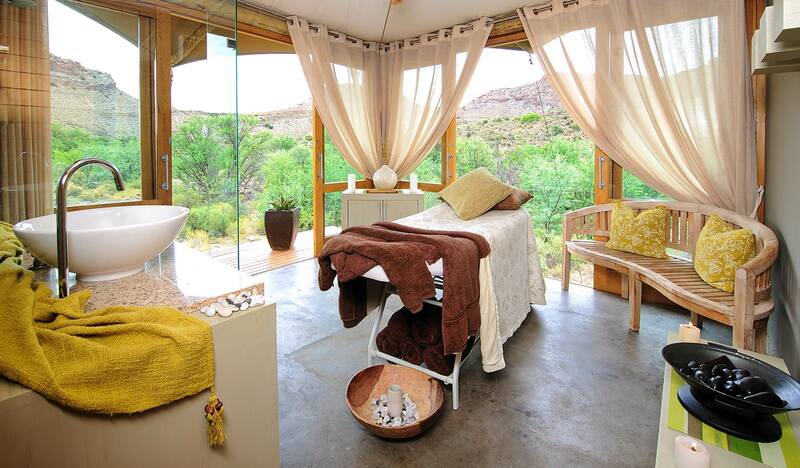 This malaria free reserve in the Klein (Little) Karoo Region of the Western Cape Province in South Africa is at the foot of the Warmwaterberg Mountains, approximately 3 hours drive from Cape Town. 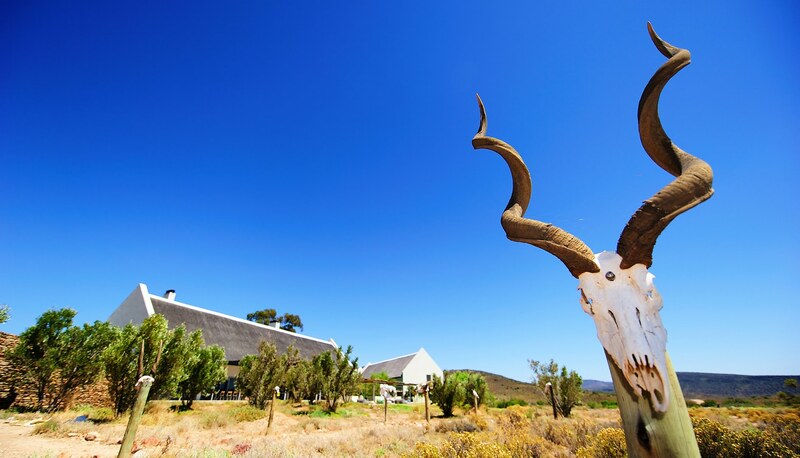 Sanbona is known for its vast Karoo scenery, indigenous fauna and flora and dramatic rock formations, as well as the free-roaming White Lions. Traverse the landscape of Sanbona Wildlife Reserve with a qualified ranger in comfortable open Landcruisers on morning and afternoon wildlife drives, and enjoy their varied species of plants, plains game, other animals, big game and birds. 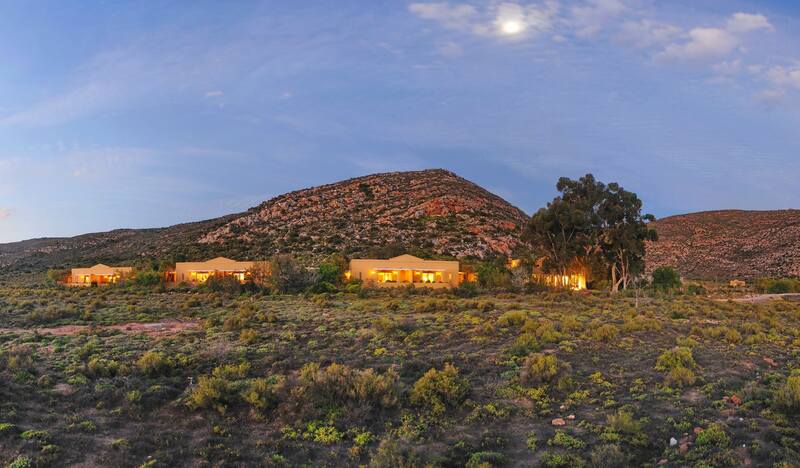 Sundowner evening drives offer spectacular displays of light as the evening sun sets over the Klein Karoo. 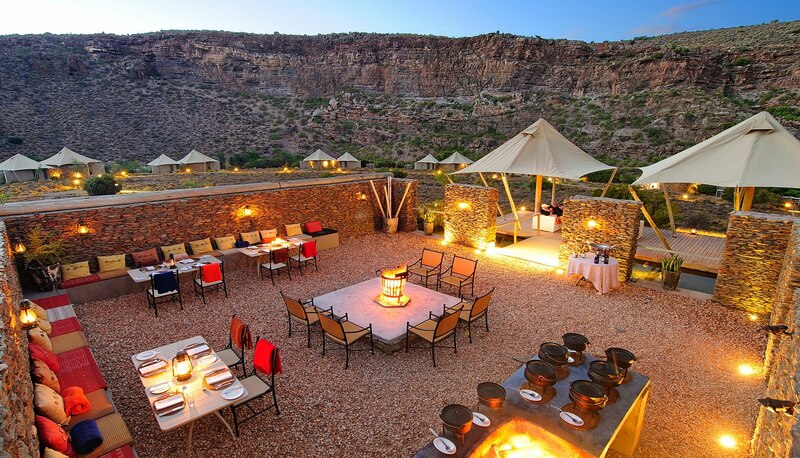 Dwyka Tented Lodge is a breathtaking retreat situated on a horseshoe bend of a dry Karoo ravine in a hidden landscape surrounded by awe-inspiring rock formations, once home to ancient Khoisan hunters. There are nine beautifully appointed tents that exude an atmosphere of pioneering adventure. Tents allow the outside in, with plenty of natural materials and floor to ceiling windows, and sliding doors for light and stunning views. 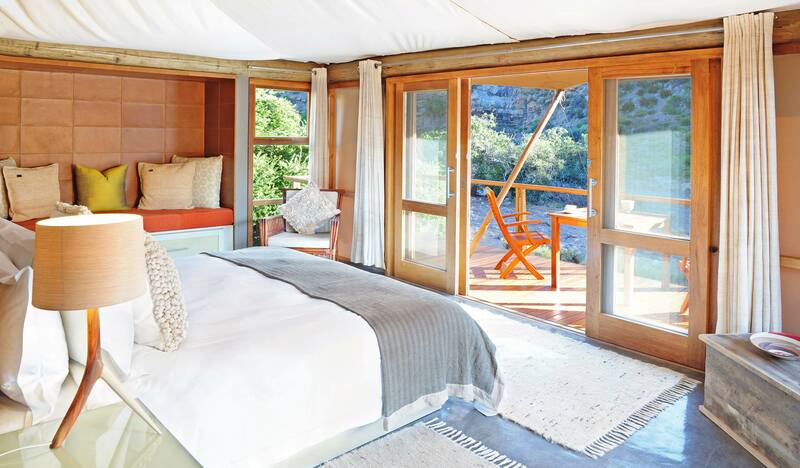 Well-spaced for maximum privacy the tents are raised off the ground, spacious with splashes of Karoo colour, have en-suite bathrooms with an indoor shower, separate free-standing bath, twin basins and outdoor shower, cooling system, under-floor heating, private minibar, tea and coffee facilities and a private deck with a plunge pool. 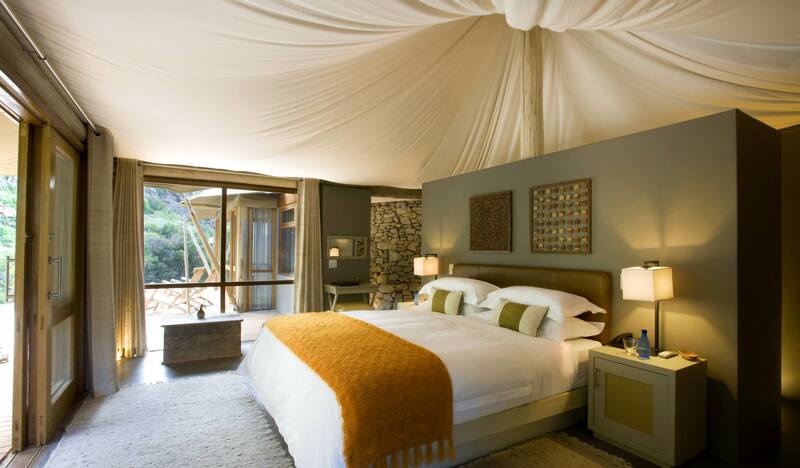 From the tents, natural pathways lead to the main lodge area set under a romantic canvas canopy. 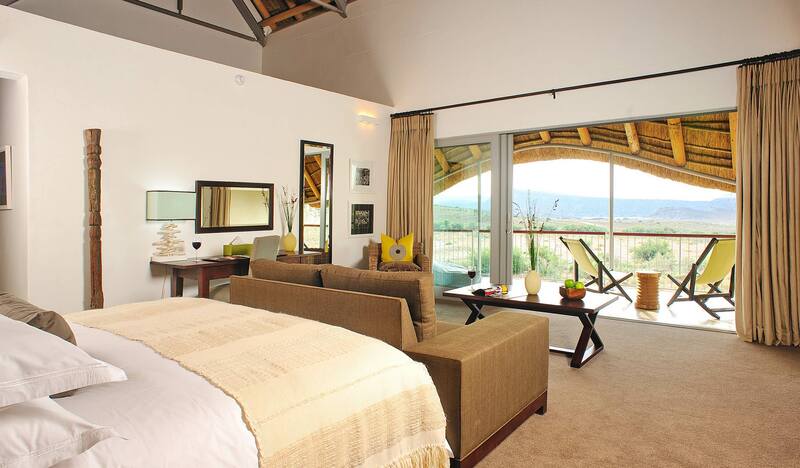 There is a lounge with a fireplace and satellite television, open-air dining boma, wine cellar, boutique gift shop, relaxation retreat with two therapy rooms and WiFi. Home to a rehabilitation program to introduce White Lion back into the wild, a stay at Sanbona includes game drives and nature walks (no children under 16 on walks). Additional activities featured include star gazing, bird watching, rock art walks or, the freedom to do nothing at all. 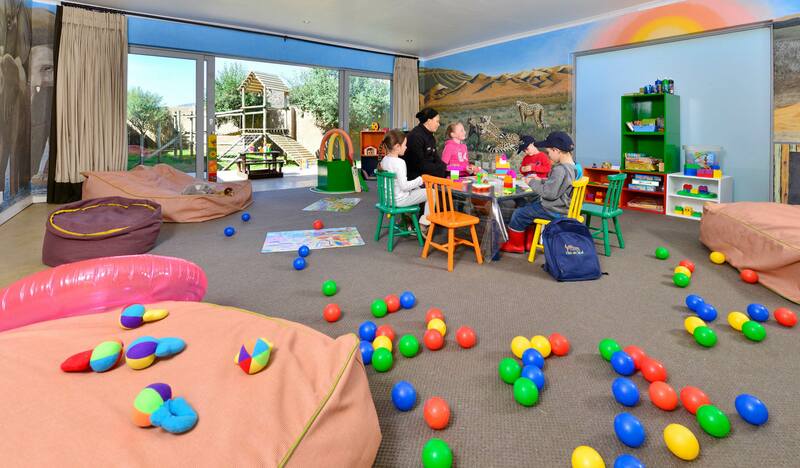 Gondwana Lodge is child and family friendly. 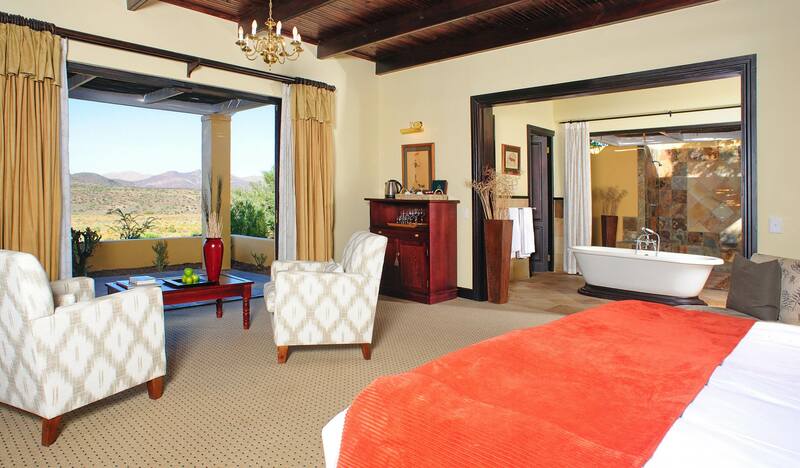 It has 12 rooms that have views over the plains of Bellair Dam and the Anysberg-mountains. 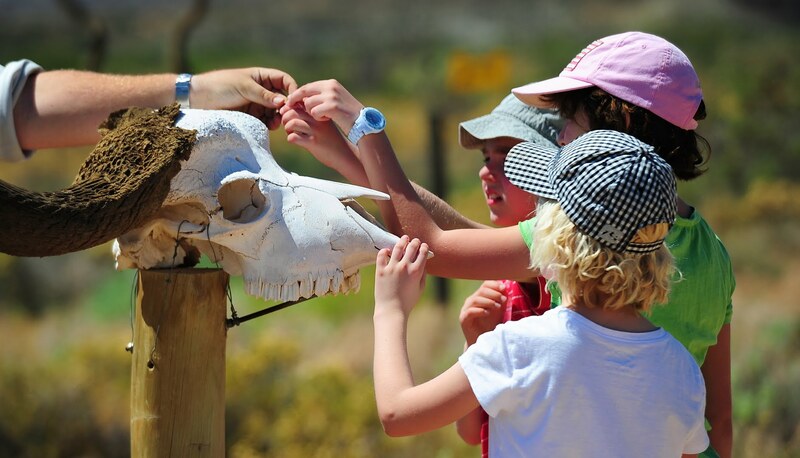 Children of all ages are welcome to take part in the educational 'Kids on Safari' program. 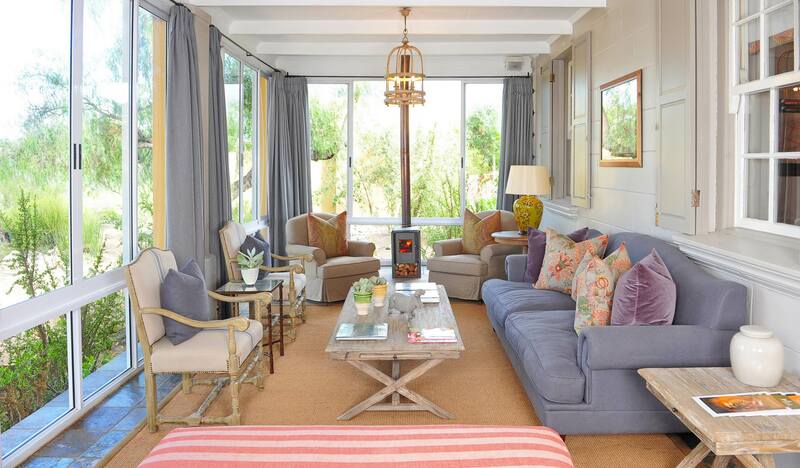 All the rooms have private patios, underfloor heating and comfort cooling. The Lodge has a fence around its perimeter, a children’s playroom and TV, as well as a swimming pool with a shallow area. 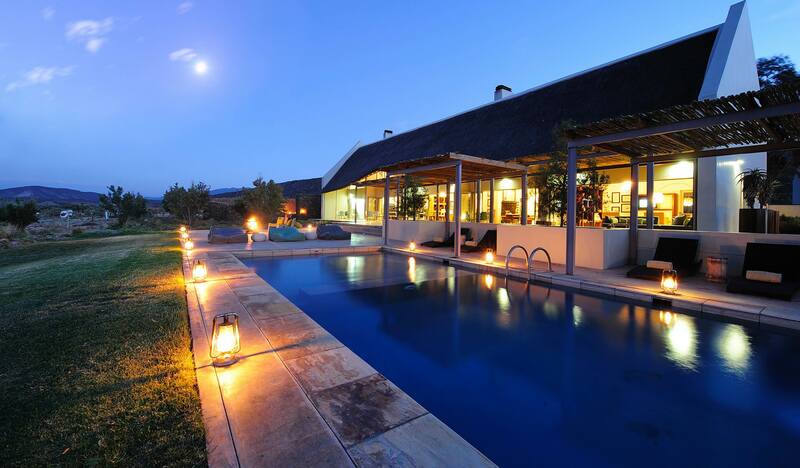 Tilney Manor is an elegant, exclusive retreat, surrounded by a carefully laid out indigenous garden, overlooking breathtaking views of undulating mountains and plains of the Karoo. 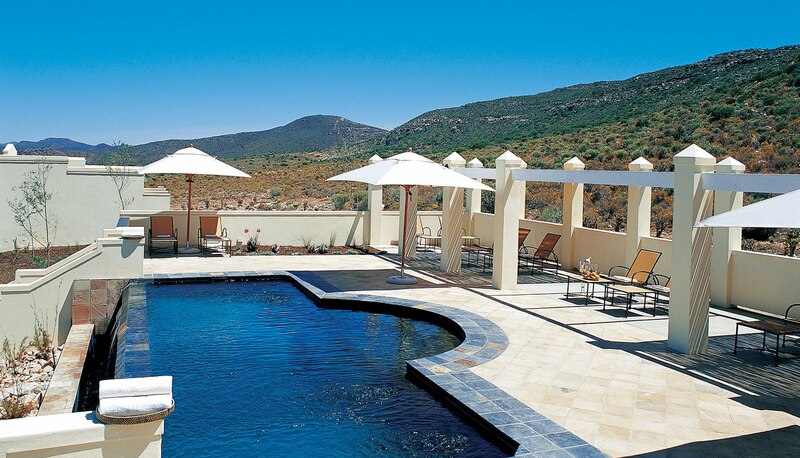 A Cape Georgian style homestead, Tilney Manor offers three separate units with six luxury open plan suites; three king suites and three twin suites opening onto private verandas with beautiful Karoo views. With natural interiors to match the surrounding stone and vegetation, suites feature en-suite bathrooms with shower, twin basin and free-standing bath as well as outdoor showers; air-conditioning, television with DVD player, fireplace, minibar and tea and coffee facilities. The main lodge includes a lounge with a fireplace and satellite television, indoor and outdoor dining areas, relaxation retreat with two therapy rooms, a steam room and sauna as well as a beautifully located rim flow swimming pool. 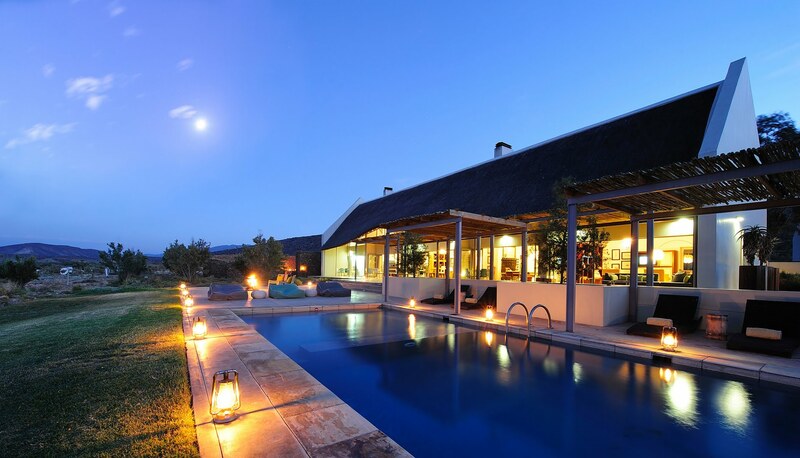 Home to a rehabilitation program to introduce White Lion back into the wild, a stay at Sanbona offers game drives and nature walks (no children under 16 on walks). 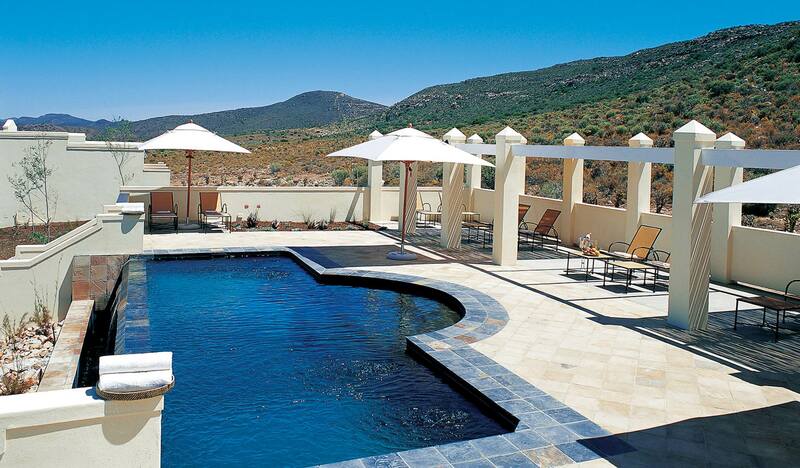 Additional activities include star gazing, bird watching, rock art walks or the freedom to do nothing at all. 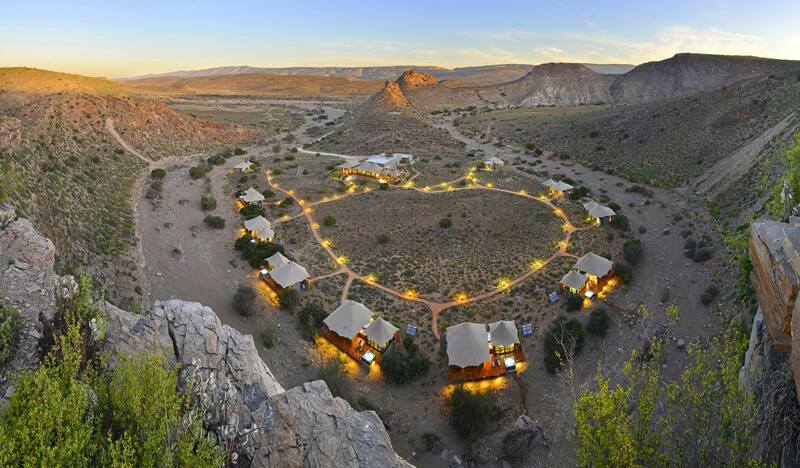 Sanbona Explorer Camp is a unique walking experience, ideal for guests looking for an adventurous and authentic tented bush camp option. 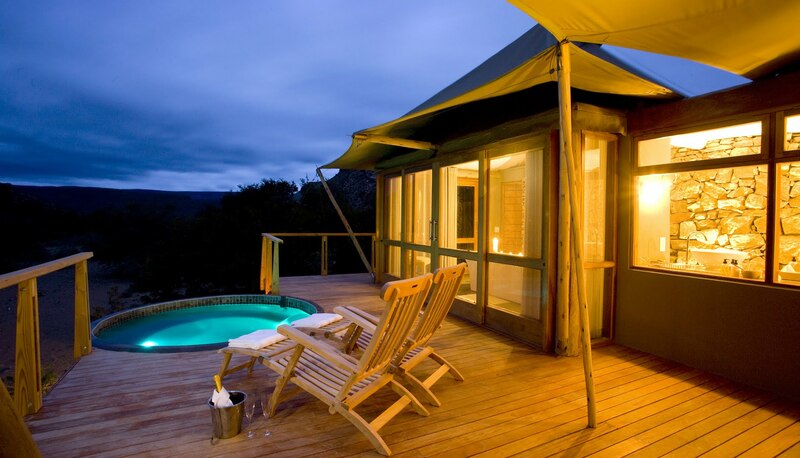 The camp is located in a superbly shaded river line, north east of the reserve and approximately 30 minutes drive from Dwyka Tented Lodge. 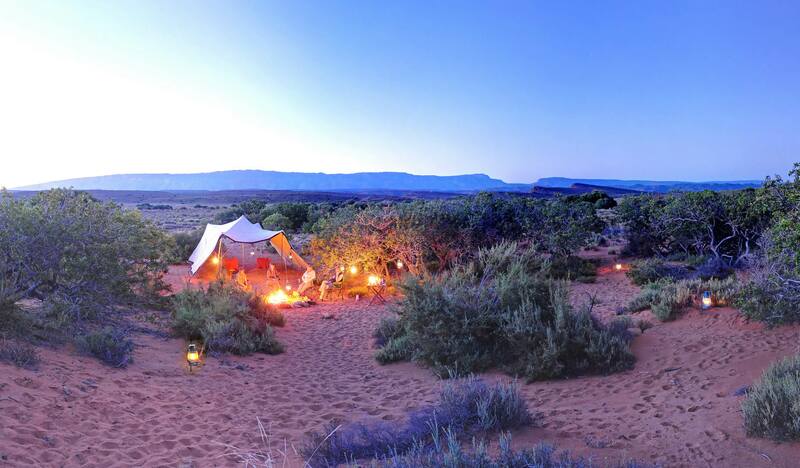 This explorer camp reflects the original safari of being on foot and sleeping around the fire at night within the comfort of a mobile tent. 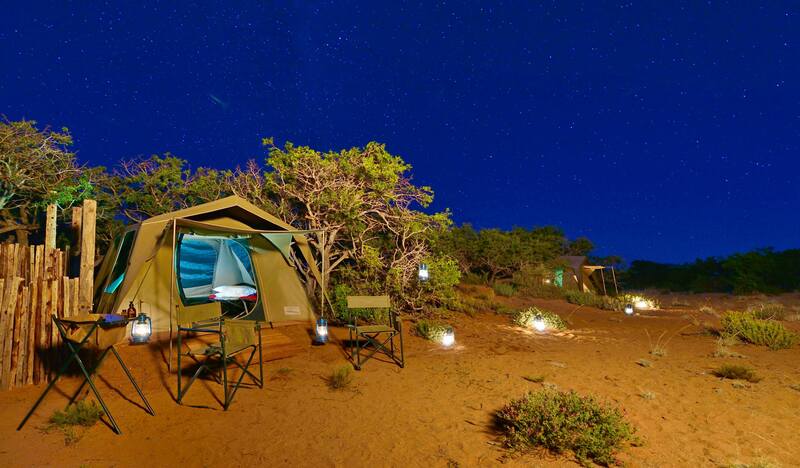 The Explorer Camp operates from October to April (South Africa's summer months), with a set departure each Friday. The trails are hosted and guided by an armed qualified walking guide, distances walked vary each day but can last up to 4 hours. A game viewing vehicle remains in camp and depending on where guests walk that day, the trail may start from camp or depart camp by vehicle to visit another area of the reserve. We regret that no persons younger than 16 years or older than 60 years will be able to participate. However, if a medical certificate can be provided via the client or the booking agent, exceptions to this will be allowed. Tents are placed in fairly close proximity, without encroaching on another tents privacy, with a maximum of 6 guests in camp. 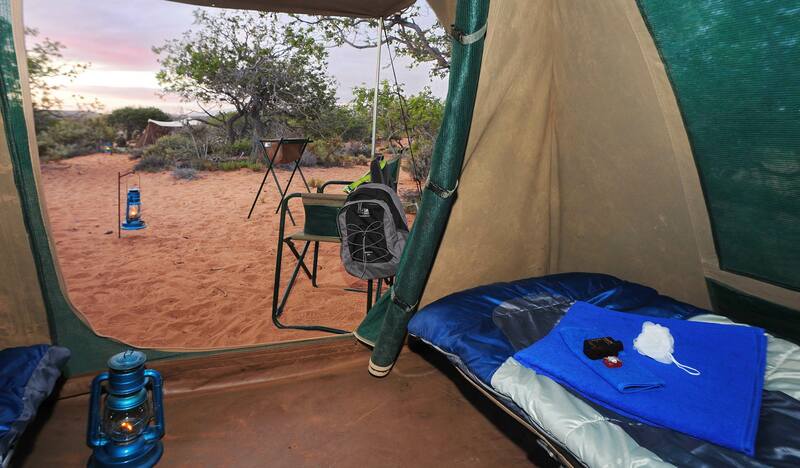 There are three walk-in mobile canvas tents sleeping two guests per tent on fold out aluminium stretchers. The tents have duvet and pillows, a small three tier cupboard, LED light for night-time use, an outside hand basin and a hammock nestled next to rock figs and basalt rocks. The camp has one outside shower (with hot water) and toilet which is shared by guests. Bathroom amenities are supplied. Wild animals are able to cross through the camp at any time and although all safety precautions have been followed in setting up the camp, this is a genuine wilderness experience. Dinner is around the camp fire and relaxation time is enjoyed from your hammock! Please Note - Sanbona Lodges are approximately 40 minutes drive into the reserve. Guests are picked up from the welcome lounge on arrival at 12h30 or 16h00 (guests arriving on the later transfer will not be able to join the afternoon game drive). 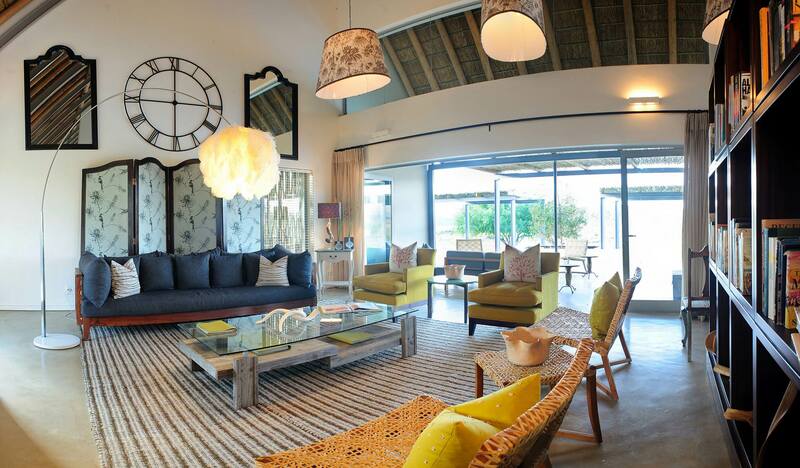 Departing guests are picked up from their lodge to be back at the welcome lounge by 12h30.